At the upper end of the quality German kitchen manufacturers are Next125 and Warendorf. 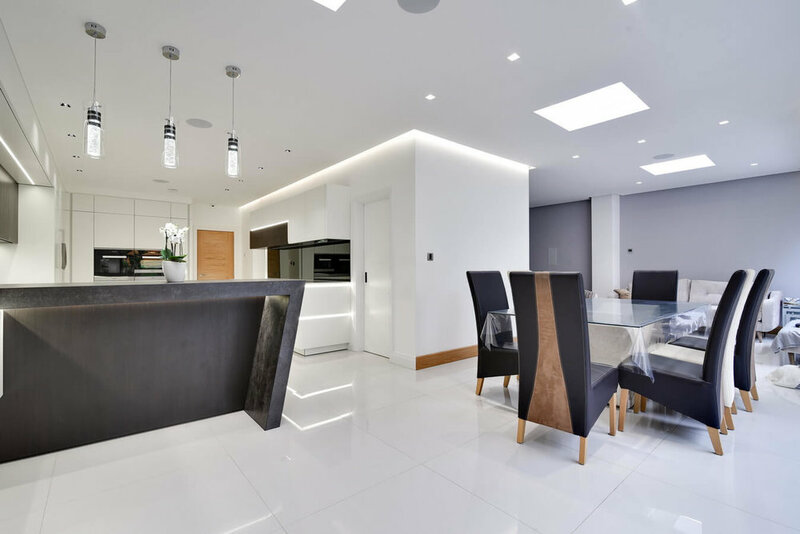 Their ability to customise finishes, shapes and even unit sizes to order allows a remarkable amount of fine tuning and detail to be incorporated into a kitchen design. 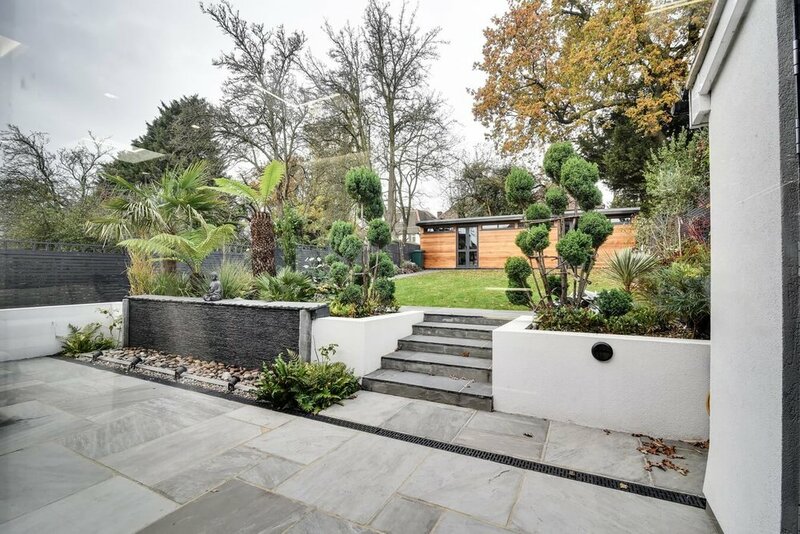 We have utilised both these manufacturers in many projects and the results are always truly stunning. Whether you want a floating peninsula or a bespoke shaped island unit, Warendorf and Next125 are able to provide a beautiful no-compromise kitchen for you. Let us know which of these designs most inspires you and we can review your requirements and come up with a design just for you. 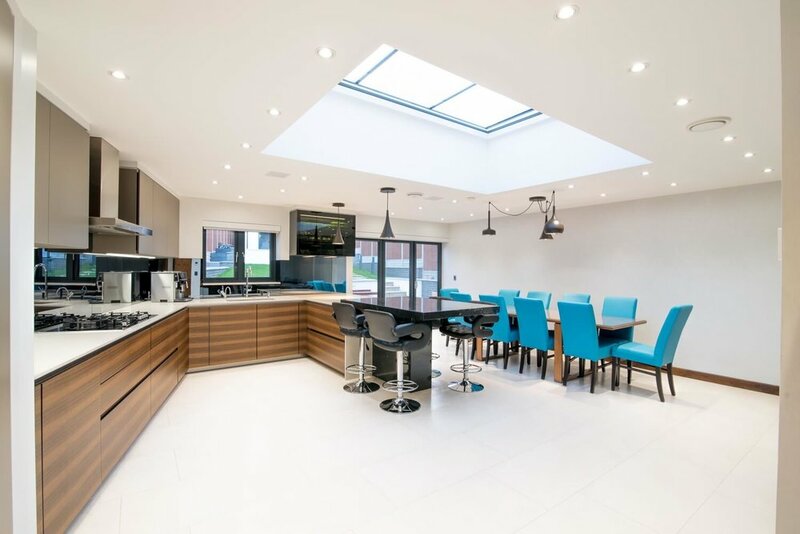 Mostly made up of Next125 white satin lacquer kitchen units with some from another German manufacturer, Nobilia, this new modern home required an almost totally bespoke kitchen to be created so it would all integrate perfectly with the large glass windows and sliding doors. Everything needed to fit with the layout of the window mullions and to do that required customisation of some of the kitchen units. We also created custom MDF boxing for wall units and around the air conditioning so that everything fits together seamlessly. Appliances are Liebherr fridge and freezer, Miele hob, ovens dishwasher and wine cooler. Blanco sinks, Quooker boiling water tap, ABK ceiling extractor. Quatrzforms Opaco Breeze Blanc worktop. There was also a small kitchenette created in the lounge area that had to blend into the room unobtrusively but with the benefit of a food lift to the main kitchen upstairs. Engineering and kitchen design came together to create a kitchen first - a floating island that perches on a small (but very strong) camouflaged platform. 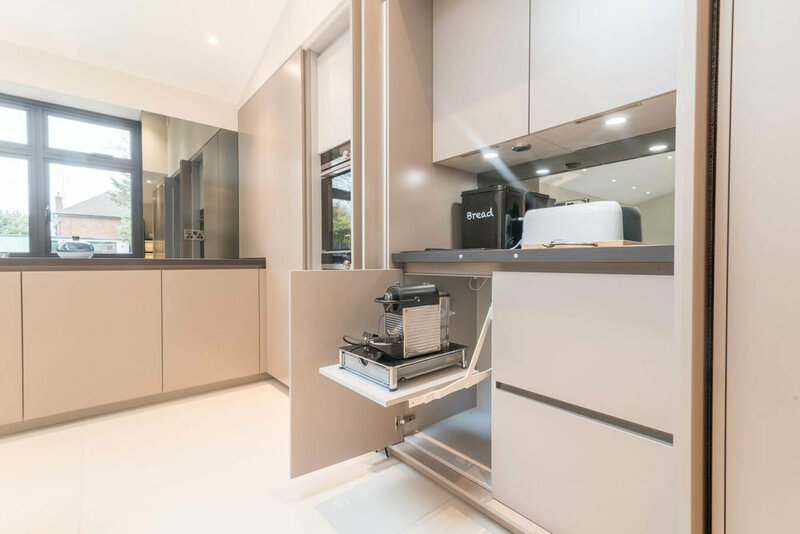 This unique project uses small mirrored plinths to create the effect of a totally floating central island in the truffle brown satin lacquer finished Warendorf handleless kitchen units. Elsewhere we used Dekton Sirius worktops and included sliding pocket doors on some of the tall units to completely hide the ovens and appliances like coffee machines and toasters when not in use. Appliance brands used here include Miele and Liebherr. Just click on the images below to browse a large selection of pictures of this one off kitchen. Warendorf aluminium titanium and book matched smoked oak real wood veneer finish for the main kitchen. Worktops are Quartzforms Opaco Breeze Blanc, the worktop on the island has a shark’s nose detail giving it a lighter profile. Appliances used were from Liebherr, Miele, Air Uno extractor. Blanco sink and Quooker for the boiling water tap. The floating island is the first thing you will notice in this project - one of our unique features at Moiety. The book matched horizontal veneer carries contour panels on the sides and the stone clads the steel structure that holds everything “in the air” and connects to the breakfast bar. Next to the fridge is a pocket doored bespoke unit used as a coffee station. The wall units all have backlit glass shelves. 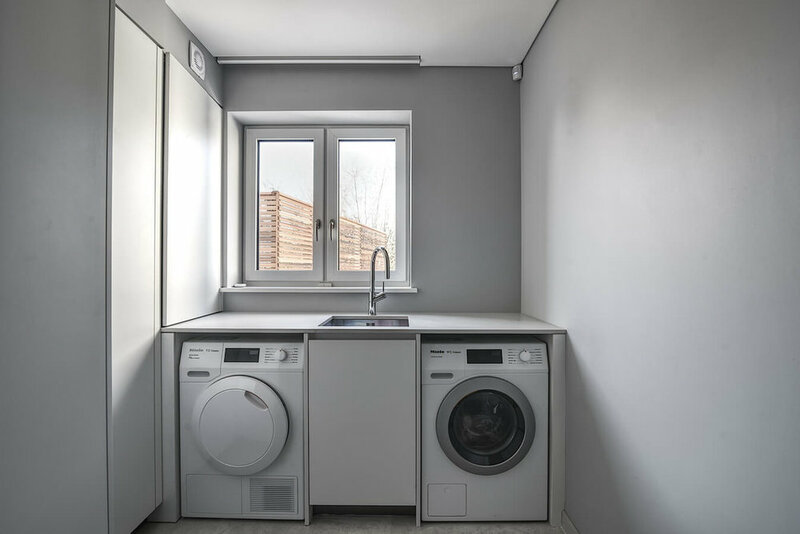 In the utility room there is a bespoke MDF pantry unit with a broom section, freezer, a sink with washing machine and dryer. We also created a large enclosed area where the boiler, water softener, grid switch for kitchen and utility and break tank booster are hidden. Warendorf opaque white smooth lacquer and laminate oak reproduction combined with a quartz worktop (Caesarstone Misty Carrera) and Neolith iron grey breakfast bar with a striking angled upstand detail. The client wanted a functional kitchen and a way to make the furniture get into the living room area without looking like a kitchen but still looking co-ordinated. 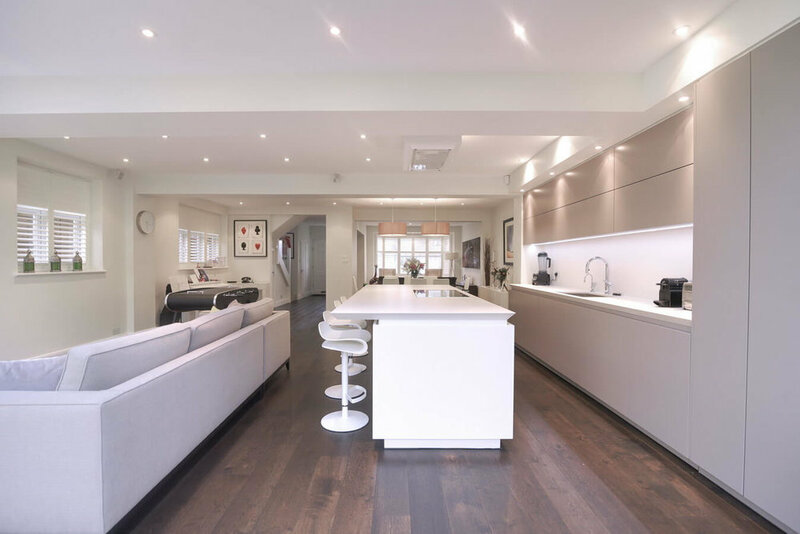 Top boxes running throughout the whole wall helped delivering the idea of continuity, and the angled Neolith breakfast bar wrapped around the Caesarstone and white furniture helps to separate the kitchen area from the TV area. 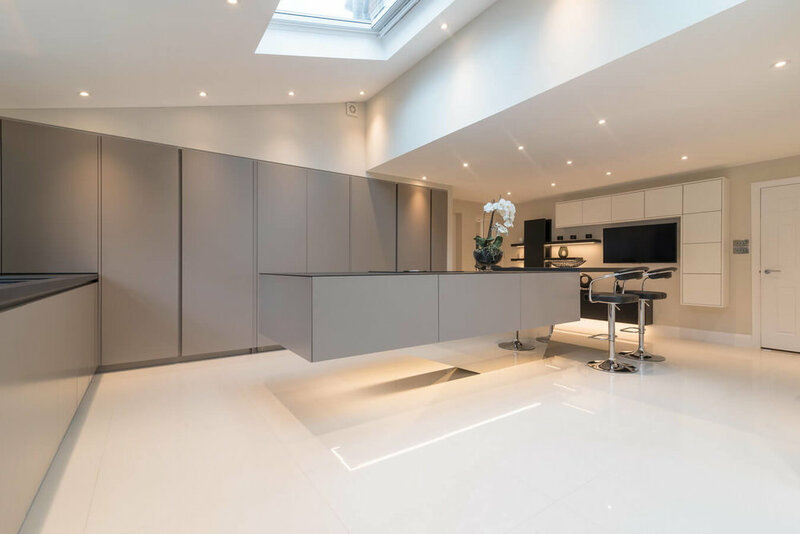 This kitchen is all about the lines, with a fine level of detail for that picked out by LED light strips in the handleless rails and under the overhanging top boxes. For the TV area, floating units and shelves have been introduced to deliver a feeling of living room rather than kitchen furniture. 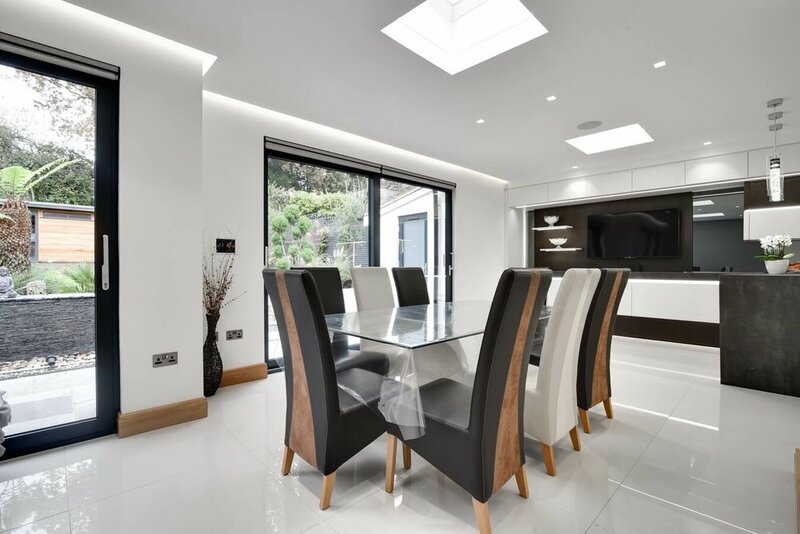 Mixing high gloss white lacquer units with a warm and stylish real wood veneer finish (Tineo “book matched”), this kitchen has modern elements combined with a vintage feel giving a real timeless look overall. The high quality double beak handleless rail Warendorf kitchen units are topped with a hard wearing Dekton Sirius Black worktop. 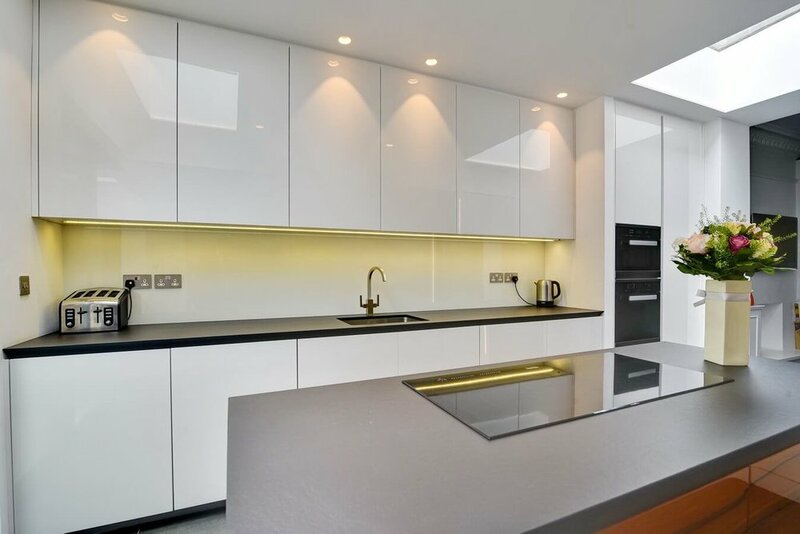 A single piece bespoke white glass splashback keeps everything looking clean and practical too. Miele appliances are all fully integrated and virtually invisible. 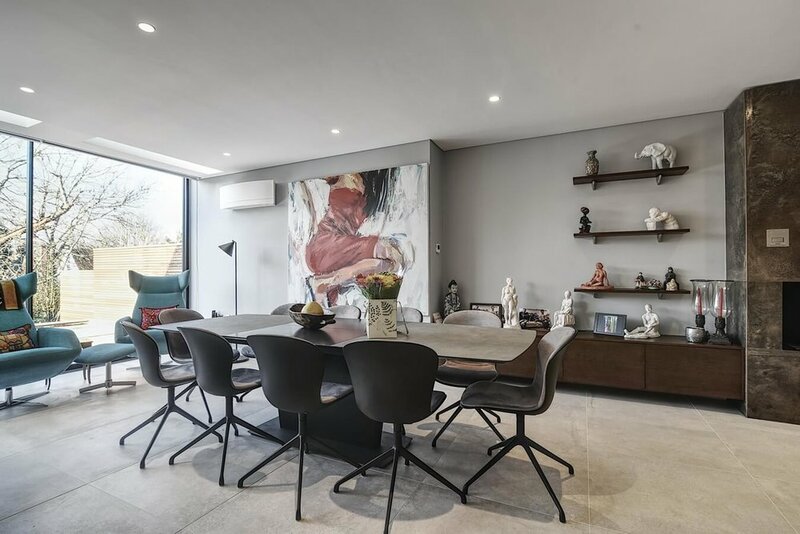 This lovely large, bright space runs right from front to back of the home in Golders Green, North London. 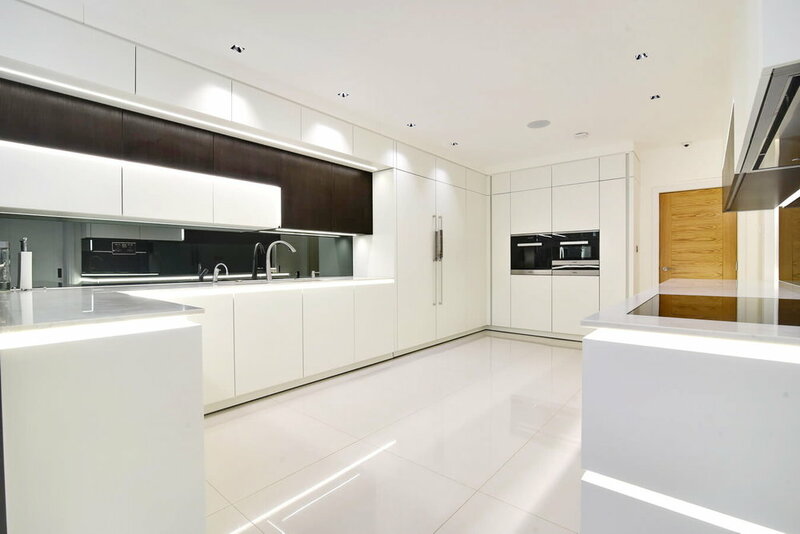 We used Warendorf kitchen units & created a segmented space for the kitchen with sleek handleless kitchen units. The integration of the kitchen was enhanced by building in a bulkhead around the units so they seem fitted right into the walls. The units are white and truffle brown satin lacquer and the worktop and matching splashback is white Dekton Zenith with a striking "sharks-nose" edge profile making the worktop seem thinner. Fitted kitchen appliances were from Siemens. Glossy grey glass doors with anthracite glass finish kitchen island using next125 kitchen units - the client also wanted us to integrate a large flat screen TV into the design so this was incorporated into a false recess created between the kitchen windows. We also created and installed a bulkhead above the sinks which then wrapped around to the tall kitchen units. This is no optical illusion, it really is a completely floating peninsula utilizing a custom designed cantilever steel support it measures 3m x 1.3m and has the ability to support 3 tonnes of weight (with no feet or legs at all). The matching bulkhead above the peninsula includes mood lighting and a Gutmann flush fitting extractor. The units come from Warendorf mixing anthracite and aluminium titan finishes to the units, the worktop is Neolith in iron grey. The kitchen appliances come from Miele and Gaggenau. 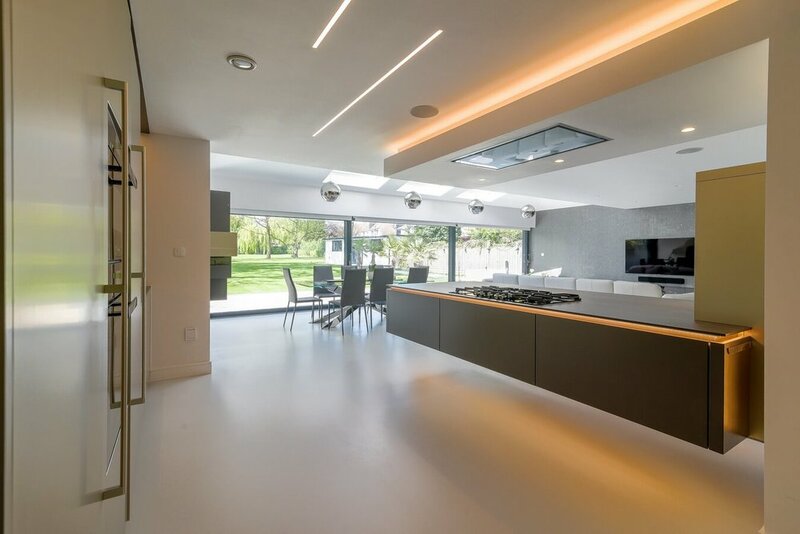 Detail lighting is incorporated throughout the kitchen to enhance the “floating kitchen” concept even further. 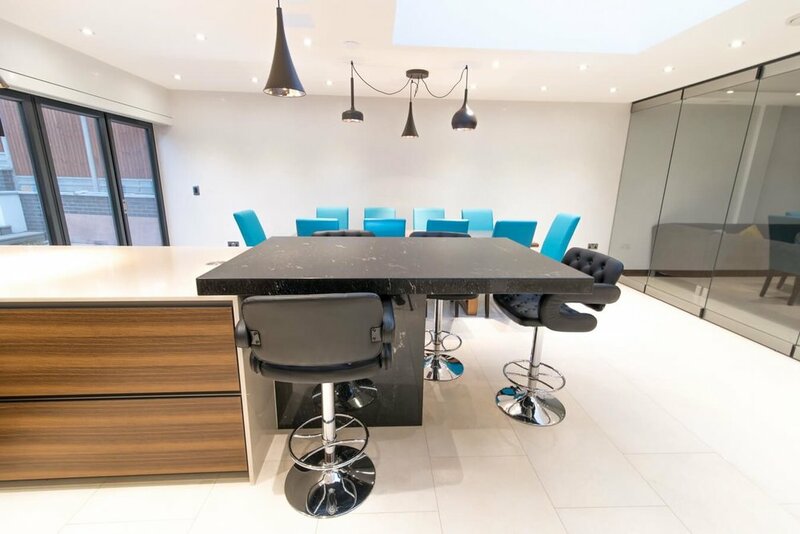 In this very large kitchen space we created a unique kitchen island using stone worktop and doors made of Neolith basalt black stone composite. The natural wood breakfast bar from Spekva is cut into the island worktop. 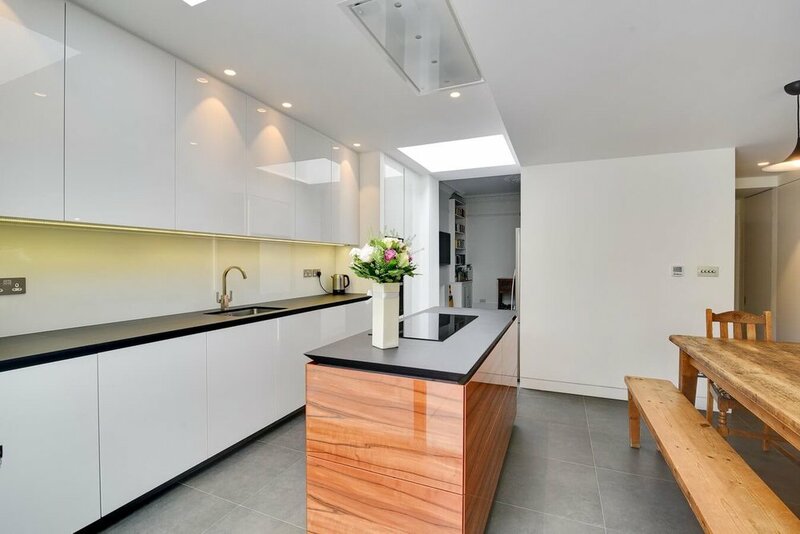 The kitchen was manufactured by Next125 and finishes to the tall units are grey matt lacquer with a grey mirrored splashback. The American style fridge freezer is surrounded by the same stone cladding that was used for the island. This large kitchen space blended smoke oak tall and high wall units with Warendorf's bookmatched real wood veneer on all the lower kitchen units. The wood grain pattern matches right through the flow of the kitchen giving a very smart finish. The worktops are granite "via lacteal". 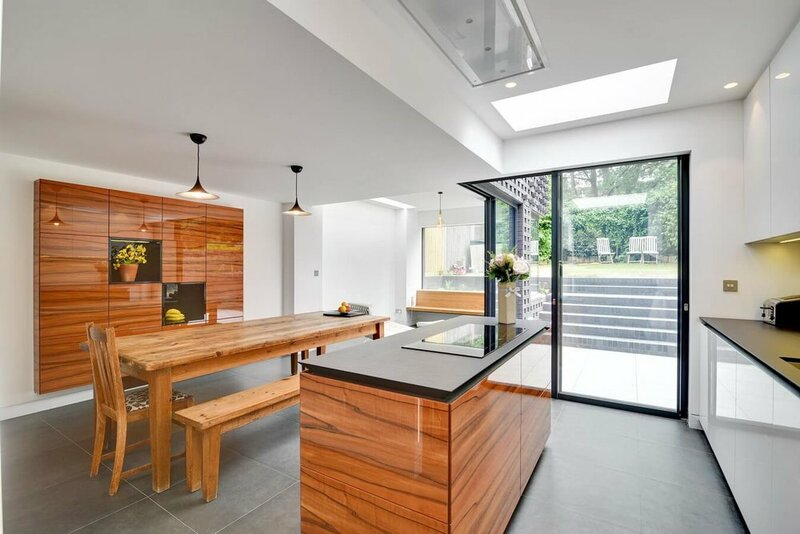 This Warendorf kitchen mixes super modern glossy white glass finish with a rustic looking knotty oak real wood veneer which adds a real feeling of warmth and vintage styling especially with the inclusion of the metal Crittall doors opening into the garden. The worktop comes from Ceasarstone (organic white finish) and we created a bulkhead with a narrow shadow gap. Appliances here are from Gaggenau and include a wine cooler and a ceiling mounted extractor from Gutmann. 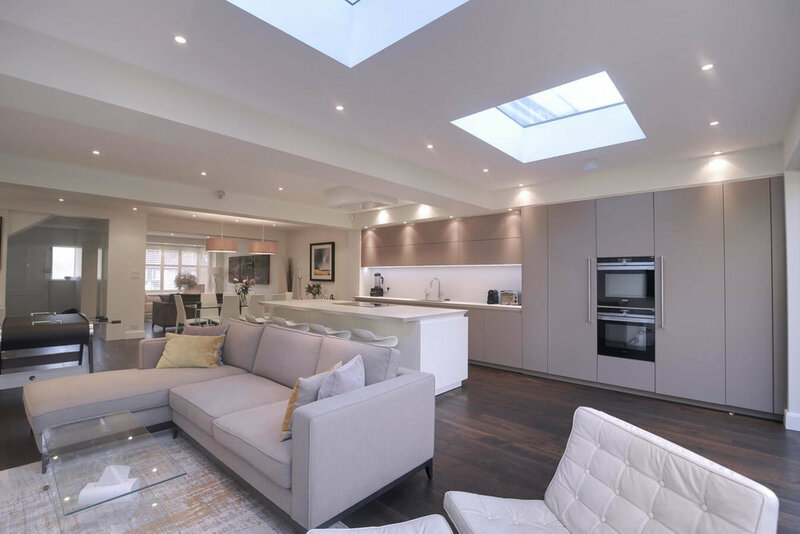 We subdivided this large space to design a clean, tidy and smart open kitchen with a hidden laundry/utility room off of the main kitchen. All designed and built using Next 125 handleless units in a high gloss finish. Cupboards hide various inserts such as the pop-out table for a blender and a hidden ironing board in the utility area. The curved edges to the island allow free movement around the feature and the Quartzite worktop has been continued up onto the wall areas to add an "organic" feel. 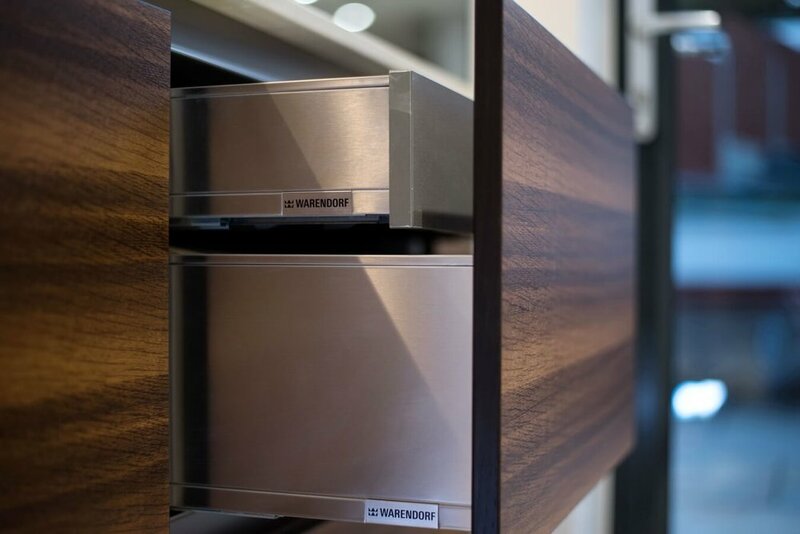 This Warendorf kitchen design was all about the sleek clean lines. 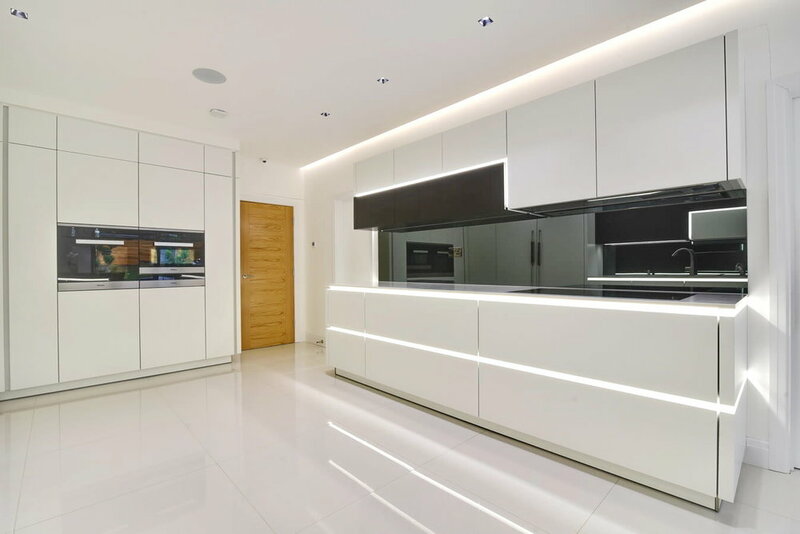 Totally handleless, glossy glass units in white all operated with electronic servo motors on the drawers and wall units. Blending traditional Danish design wood furniture with the latest in kitchen technology including Gaggenau appliances. 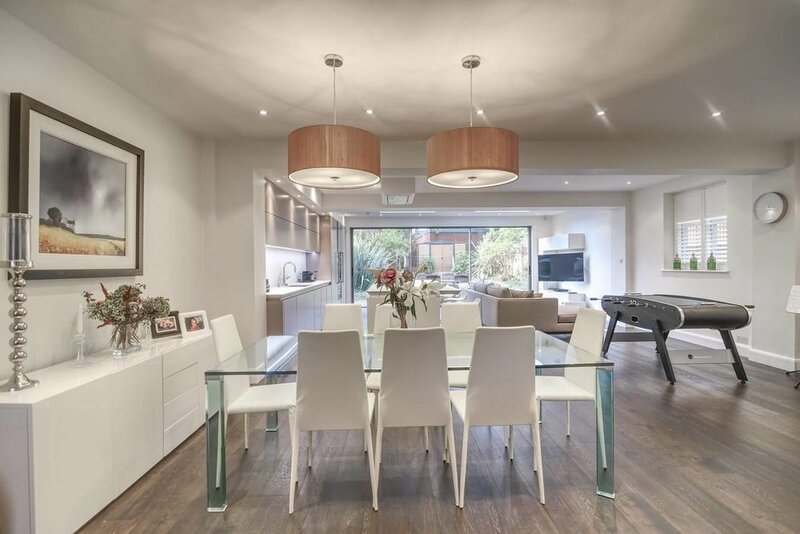 An engineering/design challenge led to the main feature of this kitchen being a double ended floating island that hides some engineering tricks to facilitate the almost magical kitchen layout. The amazing range of units from kitchen manufacturer Warendorf enabled us to achieve this unique look that was also on display at Grand Designs 2016. 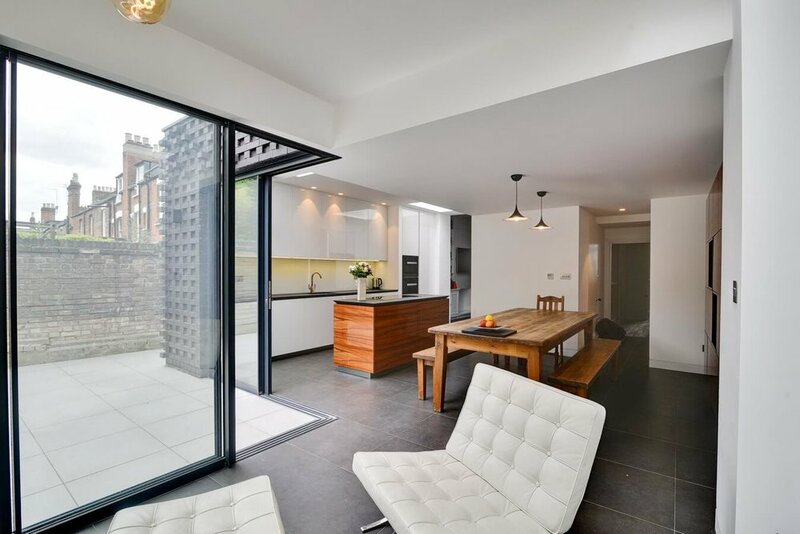 The finished look includes granite upstands and composite worktops from Quartzform. Glossy stone grey handleless Next125 kitchen units combined with a stunning Belverde granite island worktop (with a sharks nose edge profile) adding a splash of colour with the orange veining in the black stone. Our designer was also asked to create a wall unit as part of the kitchen design to house the TV and some decorative display shelving.